ETA: For my dear friend Michelle and anyone else who might be interested, the letters on the banner are from the Storybook-Cricut Cartridge. I found mine on clearance at Wal-mart several months back...I'm not sure if they even carry it anymore? Punch on the card is UPPER CREST by Fiskars. It's been a while since I've had a request for a banner, but this one is for a baby shower and then will later be displayed in the baby's room. The only requirement for the banner is that it be in a black/bubblegum pink/lime green combo. Once I had my design determined, I just started an assembly line with stamping and embellishments. Each card matte measures 5x7 and then each top matte is a 1/4 inch smaller to allow for each border to pop in color. 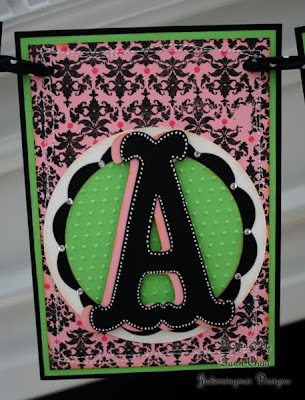 The background here is Damask Designs with hot pink dot accents. I used my Cricut Expressions to cut the letters out in pink and black. Now, I had all this put together but something felt like it was missing. The black letters just weren't as defined as I'd liked them to be, so I got this crazy idea to hand draw a dotted border! Tedious?!! YES!! But so worth it! I LOVE IT! I also received my new Tag Die from Papertrey Ink that was "die-ing" to be used! Also dusted off A Little Argyle for the background. Amazing! I can't wait for the new mom to see the banner. Hey Girlfriend! Super cute banner! What is the cartridge you used for the letters? A friend from church just found out she's going to be a Grandma again and I want to make one of these for the shower..
Ohmy gosh, how cute is that banner??!?!? You did an excellent job with the dots and the whole thing..it looks perfect! the banner is SUPER cute and so is the card! Incredible job! You are so right with what those dashes did for you letters.......Can you say POP??? Wonderful! FAB banner! The damask really makes it POP! And the hand drawn dotted lines were so worth it! wow this is so great ! I love the colors design, and every little detail !!! What a fantastic damask print! Love it and your take on the challenge! Oh WOW! That banner is really great! I love the card. Is the bottom edge a punch?